A week late but better than never! Unblogged Files July 2013. Let's do it! 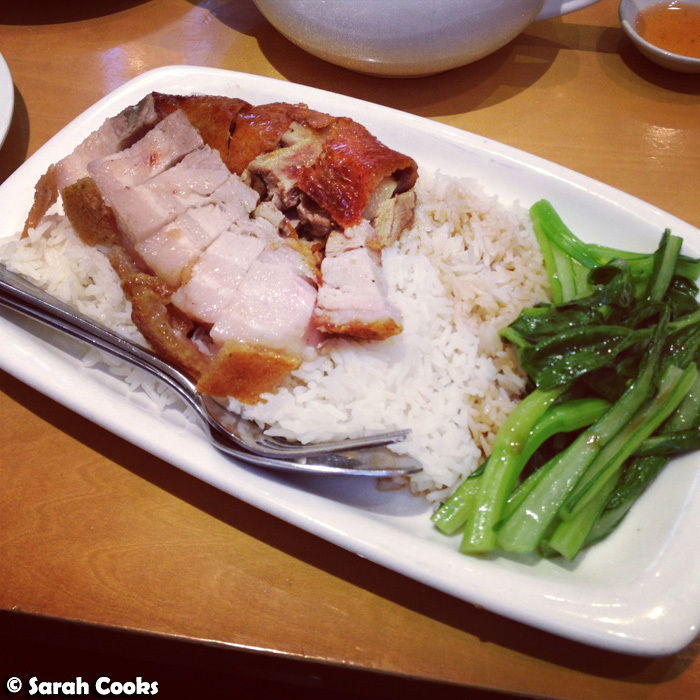 I had dinner at Roast Duck Inn (29-31 Carrington Road, Box Hill, 3128) with my parents - really great Cantonese roast meats! Although when they first brought out my siew yoke (roast pork) it came without crackling. Say whuuuut? We asked them about it and they gave me a plate with extra skin. Win! One evening I baked Dan Lepard's double chocolate Victoria sponge recipe - I reduced the quantities by 40% and baked it in a loaf tin so that I wouldn't be eating chocolate cake all week. 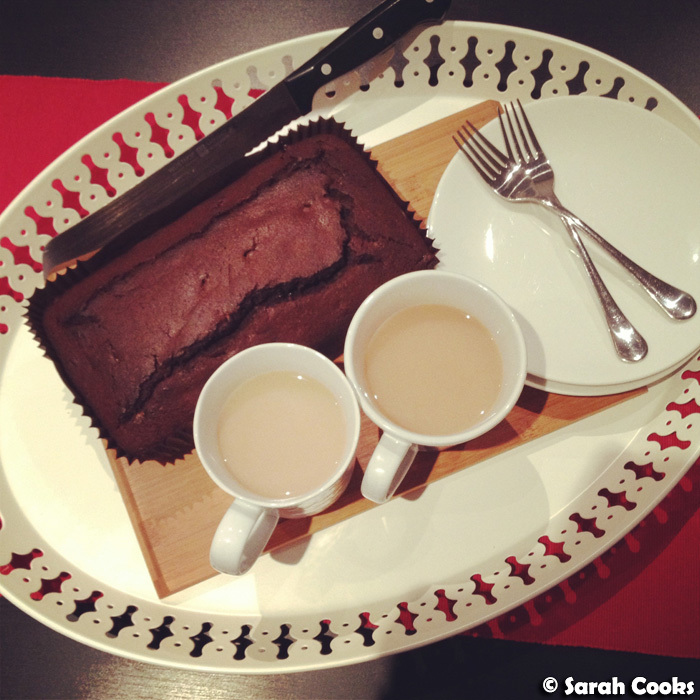 I didn't bother icing it - a nice weekday cake! 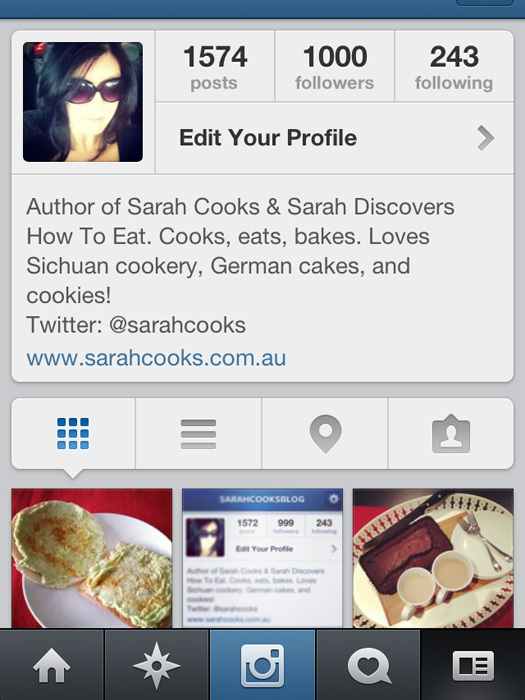 In July, I hit 1000 Instagram followers. Yay! 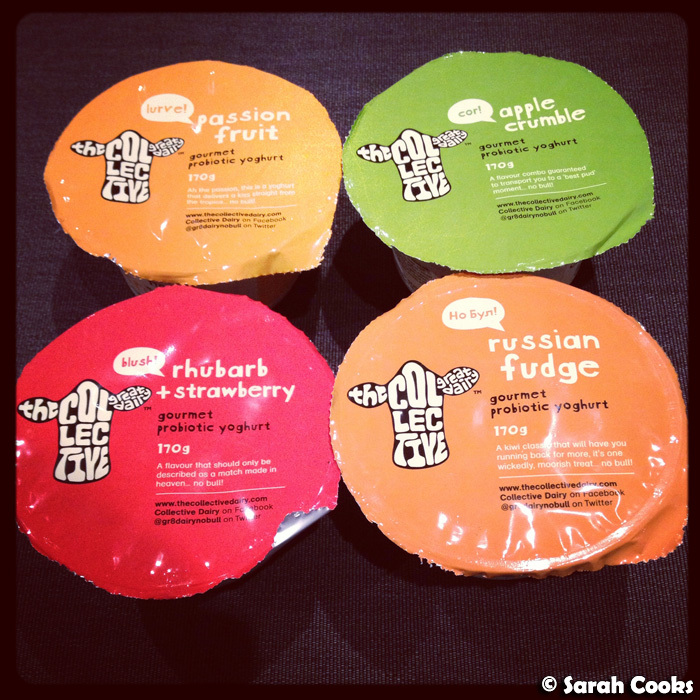 I got sent some yogurts from The Collective Yogurt to try - they style themselves as "gourmet probiotic yoghurt". My favourite was the Russian Fudge: rich and creamy yogurt with a ribbon of sweet caramel sauce. (Rather like Nigella's Barbados cream, come to think of it.) However, whilst they tasted good, and have all the feel-good properties of being gluten free, gelatine-free, preservative-free, vegetarian and handcrafted, they are very decadent, more decadent than they tasted. With about 9 grams of fat and 28 grams of sugar in each tub (even in the fruit flavours), well, I feel I'd prefer to have a chocolate bar instead. Speaking of chocolate bars... one of my lovely coworkers came back from Canada with a stash of Canadian chocolate for me. Yay! (And yes, I'm pretty sure I exceeded the 28 grams of sugar benchmark with these - oops). 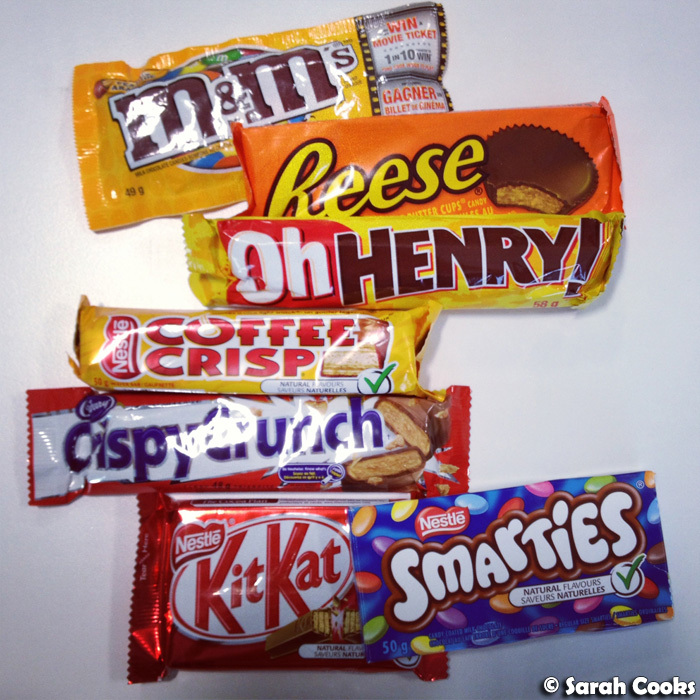 So, Crispy Crunch are like the Canadian Butterfinger (chocolate with a crisp sugary interior), Oh Henry!s are like Picnic bars but with fudge instead of the wafer bit, and Coffee Crisp are just freaking awesome! They're kinda like Tim Tams but less chocolatey - they've got wafers and cream inside with a light coffee flavour. So good! We got takeaway from Barfan Restaurant (240 Riversdale Road, Hawthorn East, 3123). 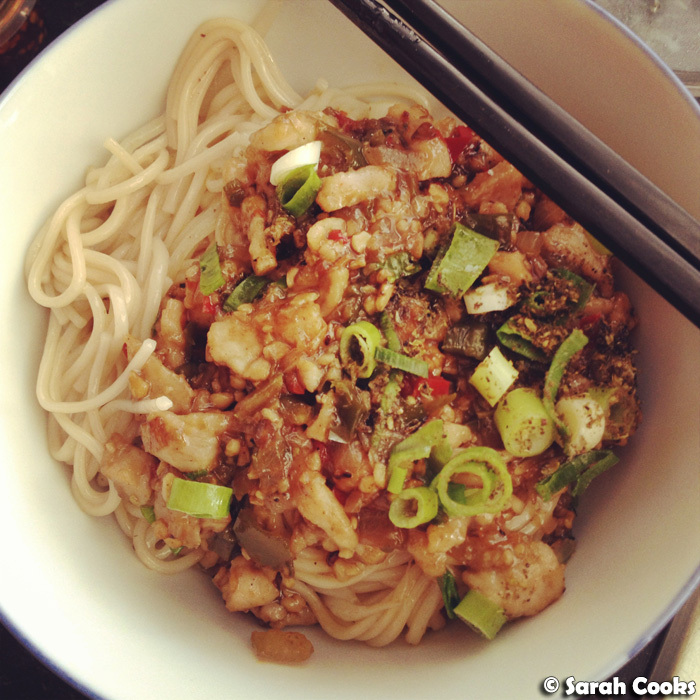 It used to be called Lynn's Kitchen, and served reliable suburban Chinese classics like lemon chicken and spring rolls, and has recently changed owners. Whilst I was sad to see the old owners go, imagine my delight when I saw that the new menu had a lot more regional dishes on it, and that the new owner told us he was from Sichuan (what, my favourite type of Chinese food!) He also gave us a little container of chilli oil just in case our food wasn't hot enough - how nice of him! I found my dan dan mien a little heavy on the Sichuan peppercorns, but definitely want to go back and try more from the menu. One night we were near Flinders Street Station on the way to see Gypsy, (Caroline O'Connor was amazing, by the way!) it was cold and we were hungry but didn't have enough time for a proper dinner. The solution? 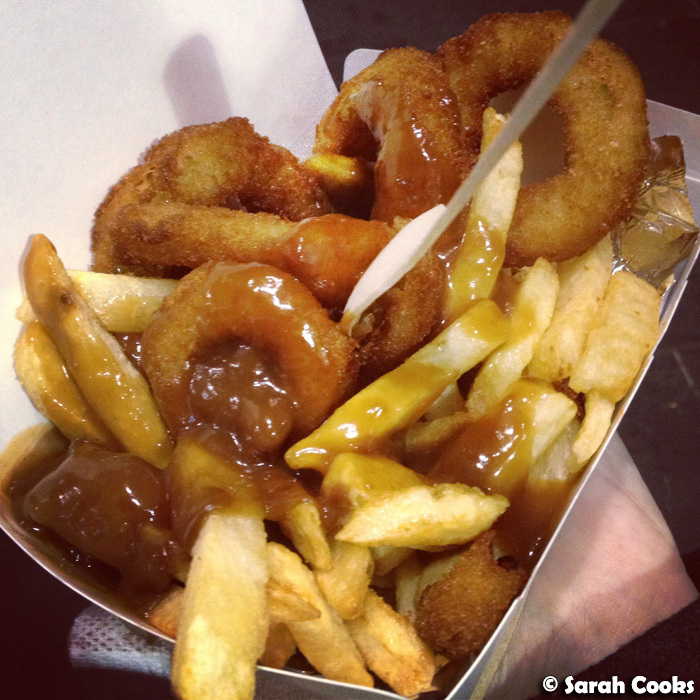 Chips and onion rings with gravy from Lord of the Fries. Totally hit the spot. One arvo we went to visit some friends of ours and their new baby, and when Katie pulled out this fab chocolate cake from the oven, I was really surprised to learn it was from a packet mix. And not just any old packet mix, but a gluten, dairy and nut free mix! Woah! Mind blown. 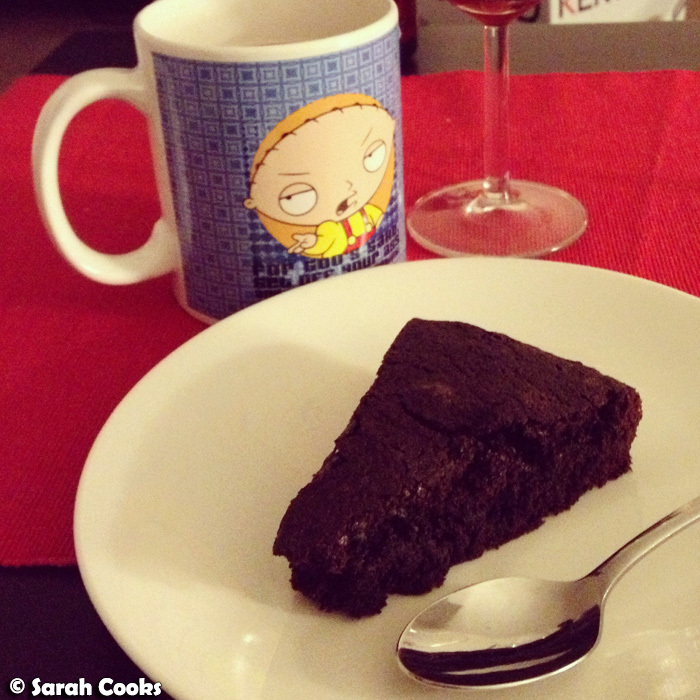 It was really moist on the inside, with a wonderfully crunchy top and a deep chocolate flavour. The brand is called "Well and Good", and I'd recommend trying it out, whether or not you happen to follow a restricted diet. And clearly demonstrating that I'm not following any kind of restrictive diet, later that week we caught up with a good friend at The Merrywell in Crown for dinner. (See my previous post about The Merrywell). 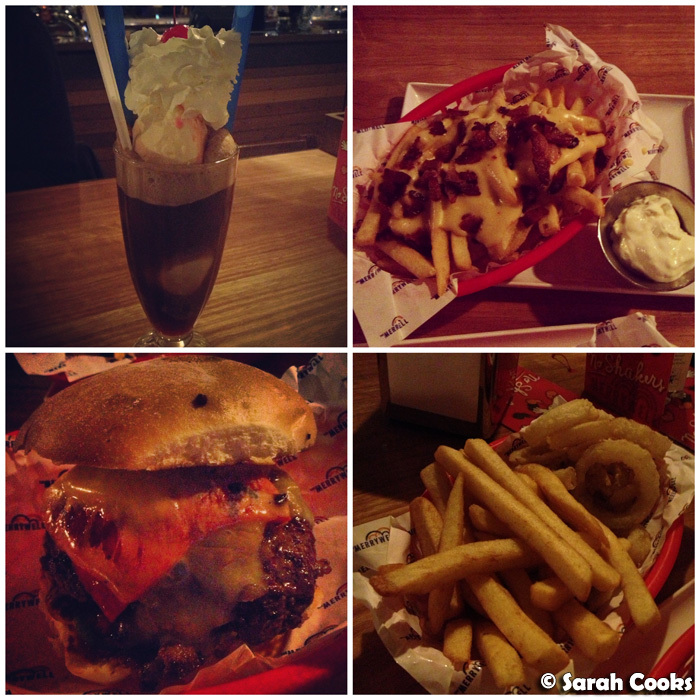 There were coke floats with insane amounts of ice-cream and whipped cream, french fries covered in cheese and bacon, and my favourite: a seriously spicy burger called the Red Eye, with poblanos, jalapenos, cheddar cheese, chipotle mayo and sriracha on a damper roll. 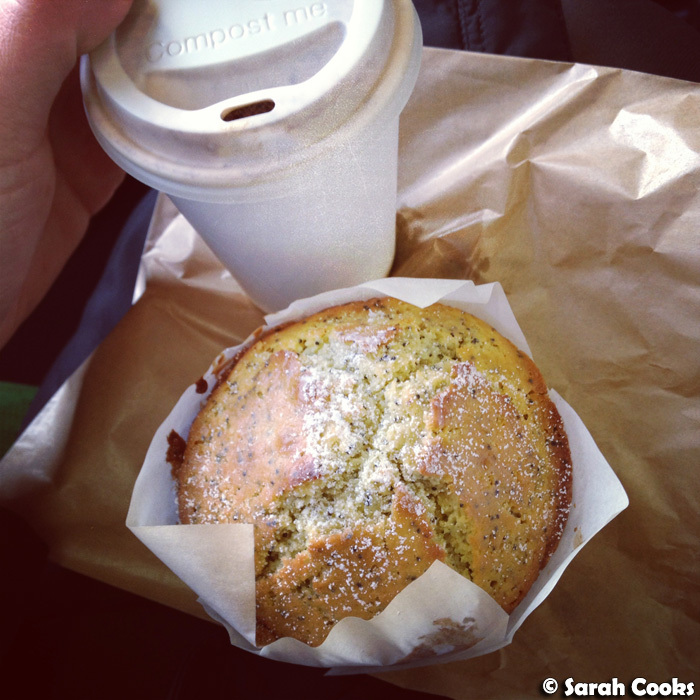 I don't normally like storebought muffins, but had a good orange and poppyseed muffin at Porgie and Mr Jones. 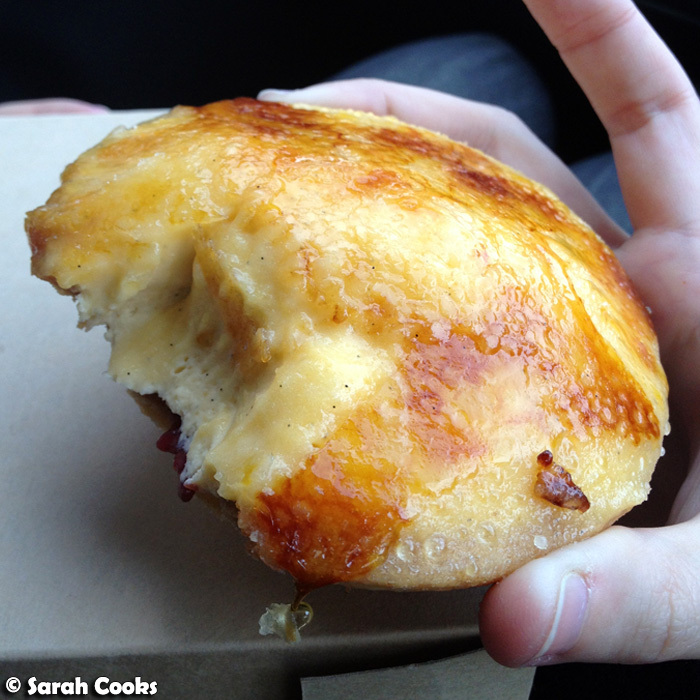 I happened to get it fresh out of the oven and it was warm and fragrant and delicious! 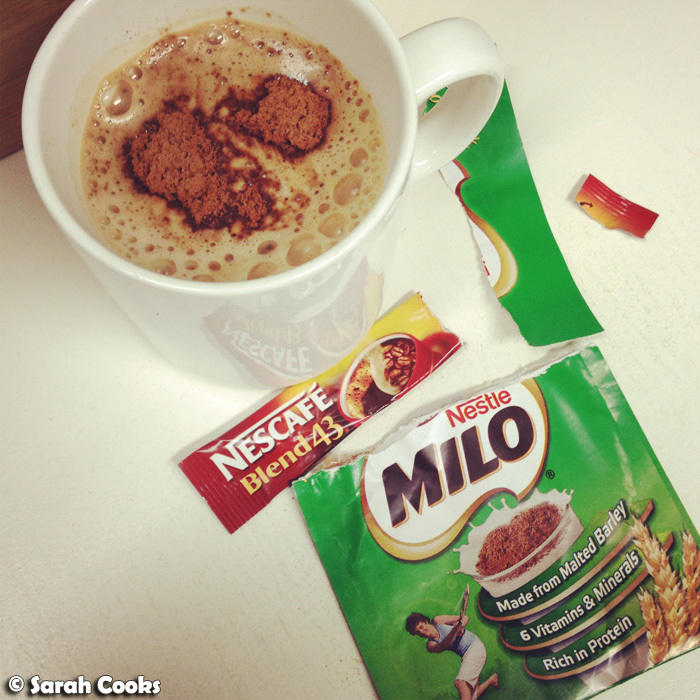 I went on a training course this month with work, and the training centre had Milo and Nescafe. Which means only one thing: NESLO! It was my mum's birthday this month. Happy birthday Mum! 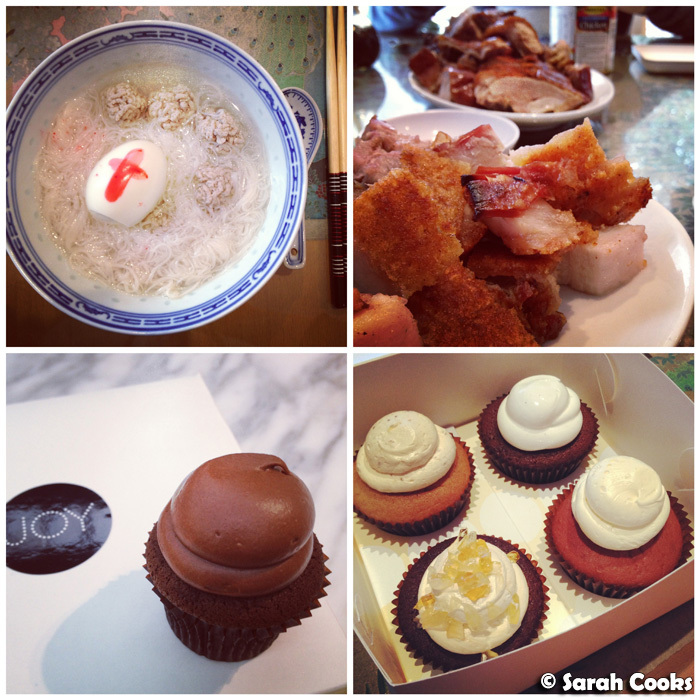 We had mee swa noodles, roast pork and duck, and Joy Cupcakes. The cupcakes looked really pretty, were moist and had soft smooth icing, but we found them to be a bit lacking in flavour - the cream cheese frosting on the red velvet barely had any cream cheese flavour, ditto the mascarpone and fig, and the salted caramel! The chocolate icing was very good though, so I'd stick to chocolate ones in future. We celebrated that night with a very good dinner at France-Soir. 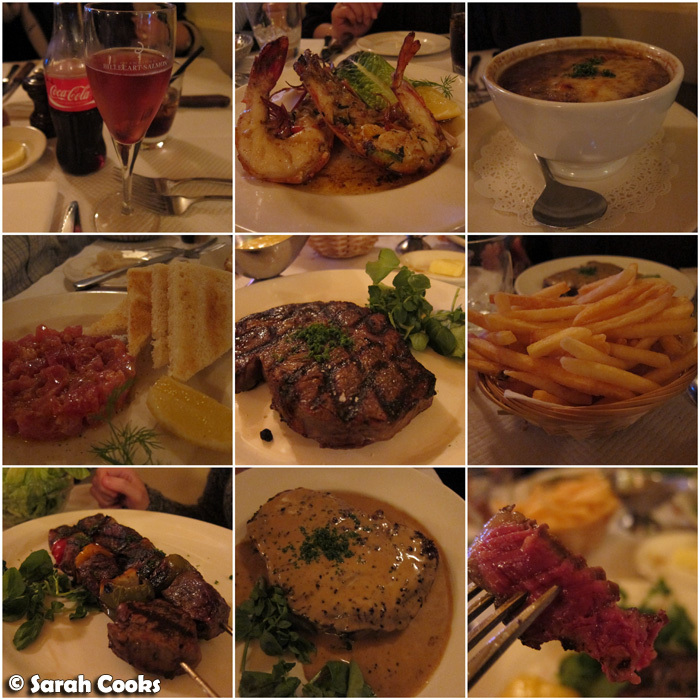 I loved the gigantic tiger prawns, the tuna tartare and the steak bearnaise - definitely recommended. 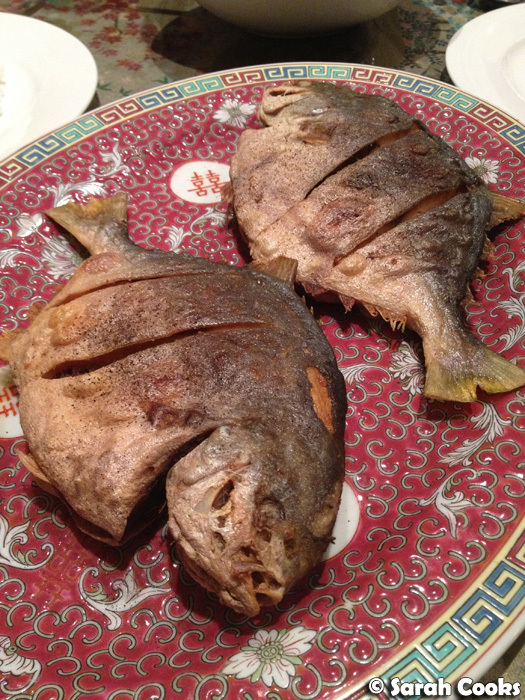 Another night, my dad fried some pomfret for dinner. I love this fish! When I instagrammed it, I had a couple of Malaysians comment that they haven't seen it in Australia. I usually find it in Asian fishmongers - keep an eye out for it! 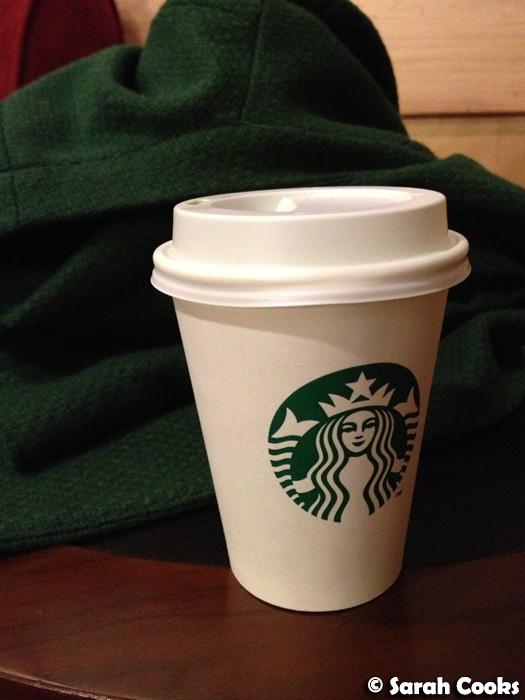 One evening when at a loose end in the city, waiting for friends, I went to Starbucks (don't judge me! ), and bought a soy matcha latte in exchange for the free wifi. Surprisingly, I really enjoyed it! I love soy milk and green tea, and I guess you can't stuff that up too badly. 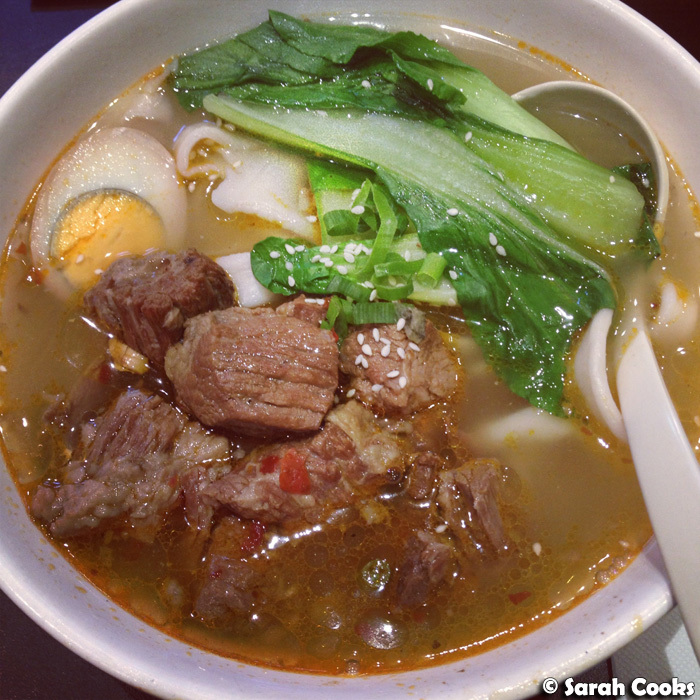 Beef belly soup with hand-made wide noodles and soy egg at Dumplings Plus (269 Swanston Street). Very nice. After reading so many tweets / Instagrams about the peanut butter hot chocolate at Bowery to Williamsburg, I just had to have a go making my own! (This was before I'd found the time to visit the cafe myself, by the way!) 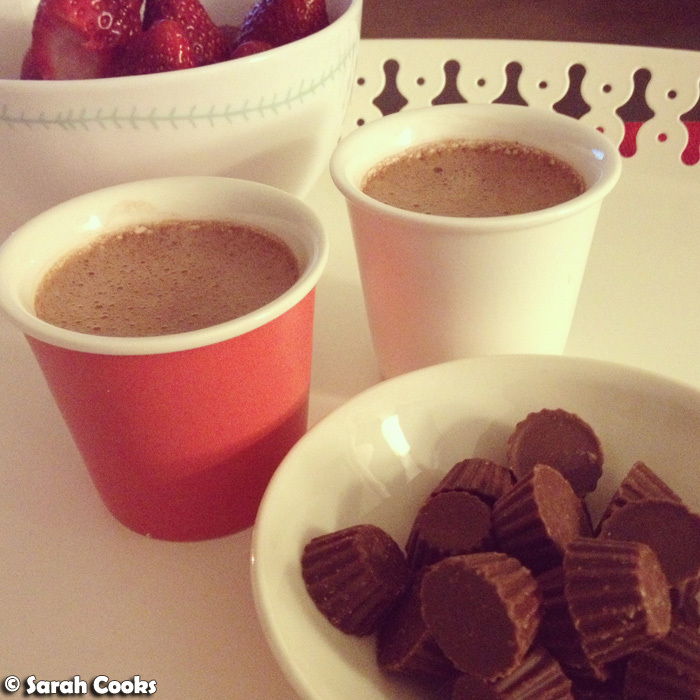 I did some googling, mixed a few recipes up, and came up with this super intense PB hot choc. It's like hot sweet liquid peanut butter. Amazing, even if I do say so myself. I'll be posting the recipe in full soon, keep an eye out! It was about a week after this that I managed to hit up Bowery to Williamsburg. 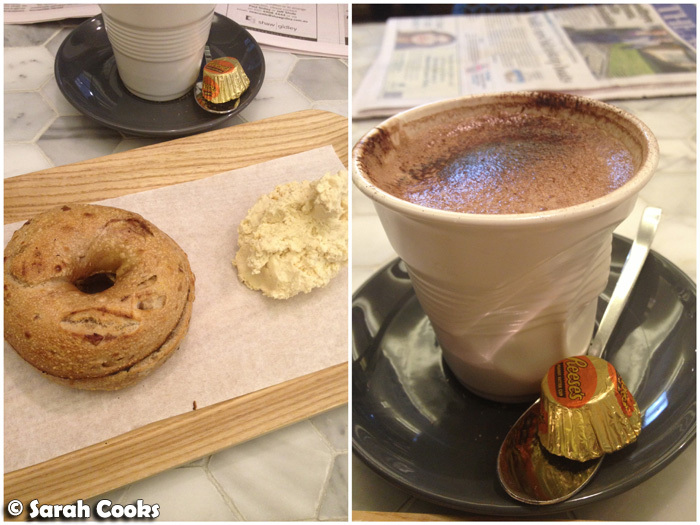 I visited twice in two days - the first time I had an amazing smoked salmon bagel, and the second time I tried their PB hot chocolate with had a cinnamon raisin bagel and a peanut butter cream cheese schmear. After reading it about it everywhere, I was super pumped to try the PB hot choc, but it was pretty underwhelming - insufficiently peanut buttery! I immodestly think that my homemade version is much better. 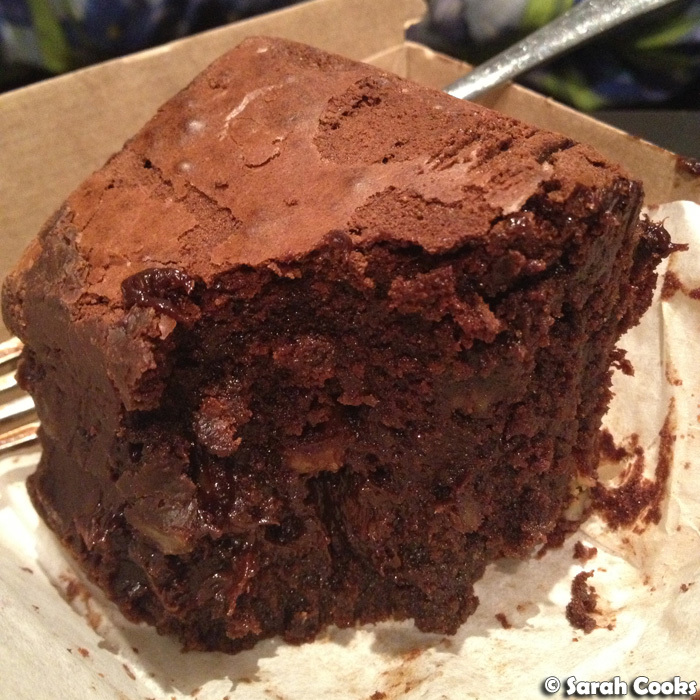 I was much, much more impressed with their incredible chocolate walnut brownie. Look how fudgy it is! Amazing. I brought it home with me and literally ate it over five days, taking tiny slices off it every now and then. Fabulous. Yes, yes, another trip to Beatrix. Their strawberry crème brûlée tart was all kinds of delicious. 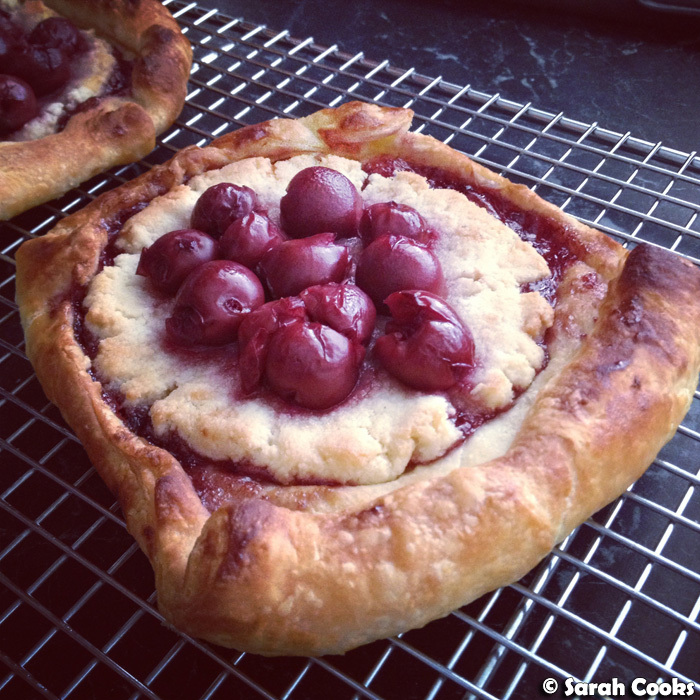 I baked cherry danishes one morning! (Nigella recipe from How to be a Domestic Goddess). They're a bit rustic, but I loved them fresh out of the oven. I have half the dough in the freezer, and I'm currently tossing up between making plain croissants or sticky pecan buns with it. 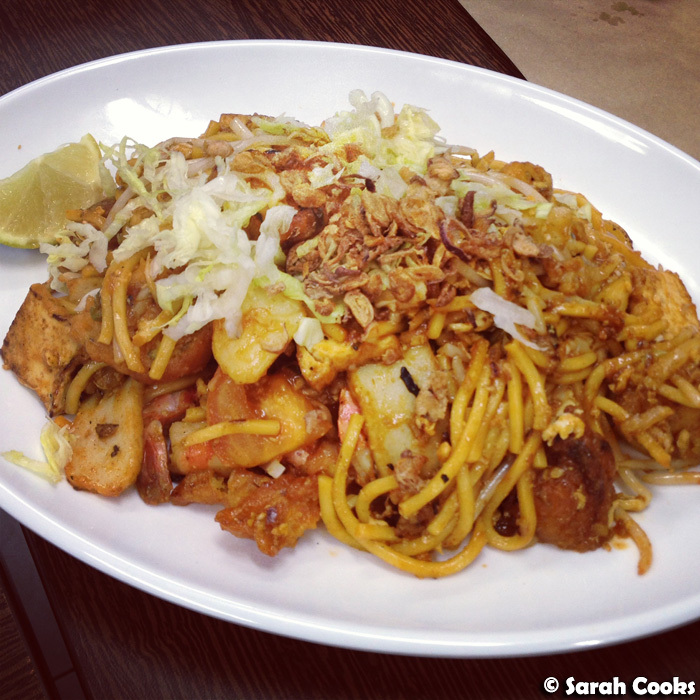 ...and my dad ordered a special: Indian fried noodles (or "Kelingar Mee" as we call them). He wasn't super hungry, so we took more than half of it home, and I ate it for lunch the next day. OMG it was so good! 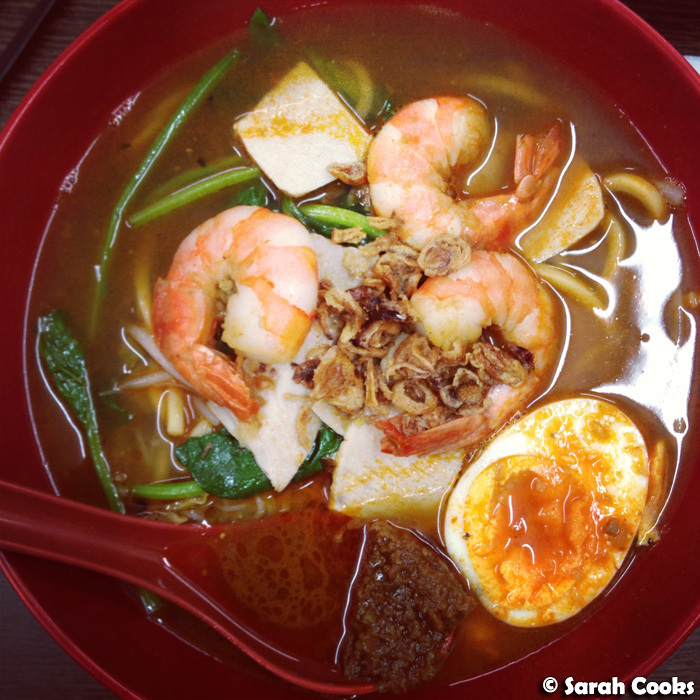 I never thought I even liked Kelingar Mee, but these were fantastic. Perfect level of spice, the noodles pere perfectly cooked, and in addition to the normal tofu, fishcake, and tomatoes, there were pieces of potato and also this doughy ball thing with slivers of kaffir lime leaves inside. I have no idea what it actually was, but I loved it! If you see this on the specials board, order it! And finally... (yes, we're getting there)... we just got a Costco membership! I don't mind the little canteen they have there. 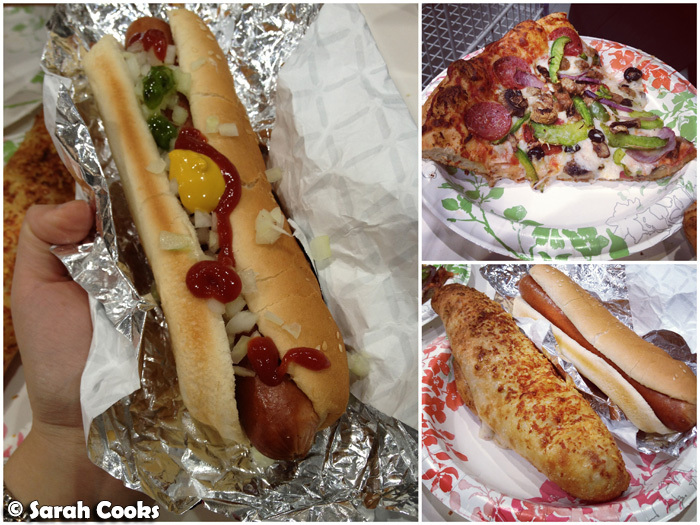 I liked the hot dog (only $2.95 with a soft drink), and I drowned it in onions, ketchup, mustard and relish! Pizzas and "chicken bake" weren't too bad either. Shopping there was pretty fun. And now I have two kilos of walnuts. Any idea what to do with them? Plans for August: catch up with friends, work, gym like crazy, maybe have a dinner party, count the days til Spring...! I think two kilos of walnuts definitely calls for walnut pide with lots of butter and brown sugar! I am a fan of all the desserts in this post. 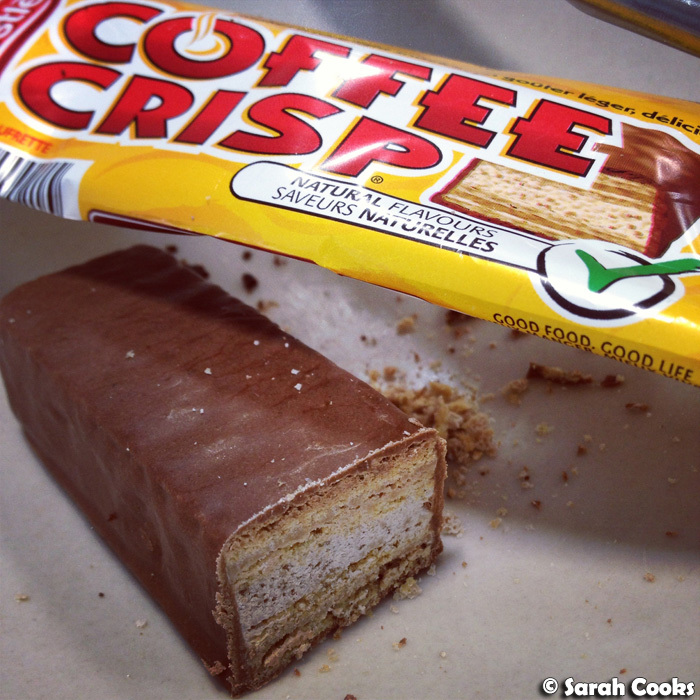 And now I must buy myself one of those coffee crisps, considering I'm back in Toronto!